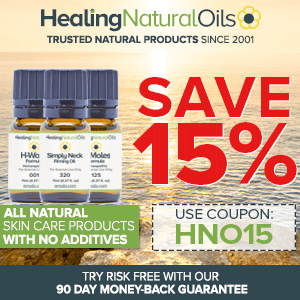 Nature’s 86 Pain Relief and Healing Oil: Inflated Claims or True Healing? An oil for pain and I don’t mean the kind of pain caused by sore muscles or strained ligaments! Yes, this is an oil meant to work on cuts, bug bites and even burns. The surprising thing is that it does not contain any herbs or even essential oils. 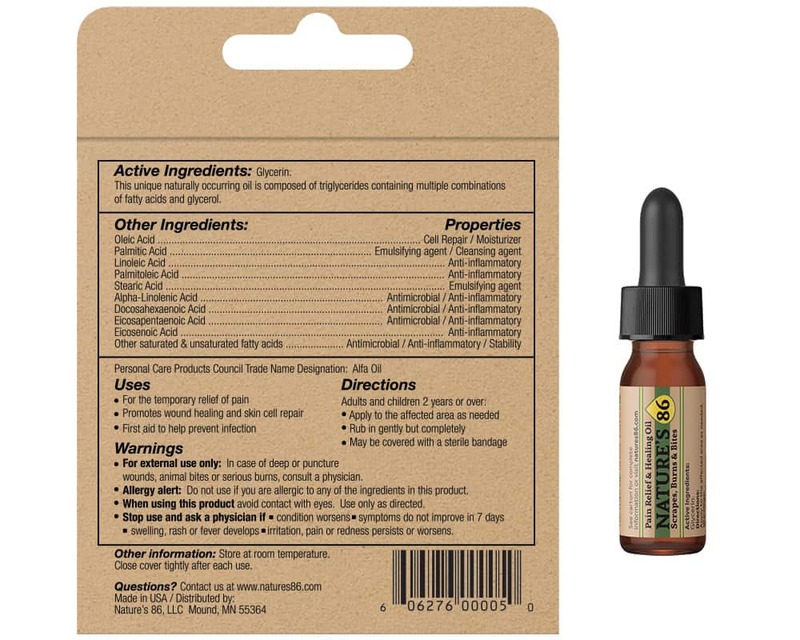 Nature’s 86 Pain Relief and Healing Oil – That is name of the product, and the makers would have us believe that their formulation can tackle the pain, the critters and the inflammation and accelerate healing with just a few drops. Call it the perfect enticement for the skeptic in me because once I read all of that, I really wanted to know if this was just another snake oil or if there was actually some merit to these claims. What I found will shock you. In fact, I’d go so far as to ask you to read this review before you buy this product. Is it a case of my product strongest? As with all products, the best way to tell if you are dealing with something even remotely genuine is to check the website of the manufacturer. Well, these guys do say a lot of positive things about their product, but what’s new there? 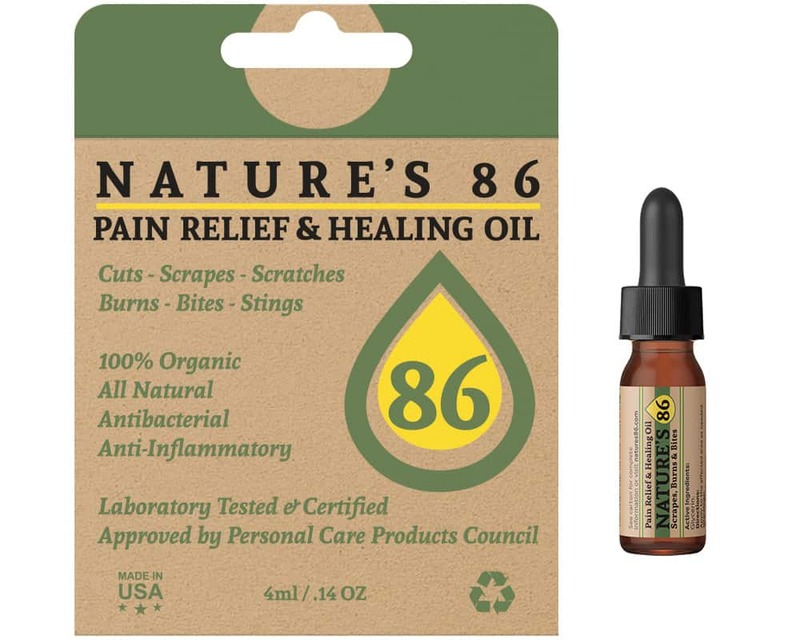 So, according to the makers of Nature’s 86, the oil is an antibacterial and antifungal agent that offers anti-inflammatory benefits, supports rapid wound healing and reduces the risk of scarring. OK, so they were praising their formulation to high heaven, but do they have proof to back these claims? A few more clicks down the line and I came back surprised. There it was; a third party lab report and what it said left me truly shocked! 96% reduction in Streptococcus pyogenes in just 10 minutes and 99.99% in 1 hour. 88% reduction in Proteus mirabilis in 10 minutes and 99.999% in 1 hour. 69% reduction in Staphylococcus aureus in 1 hour and 99.999% in 24 hours. You will recognize strep and staph as the trouble makers involved in the majority of infectious diseases. I will admit I was impressed. But here is the BIG one – 99.999% reduction in Methicillin Resistant Staphylococcus aureus in 24 hours! You may have already figured it out; those are the deadly antibiotic resistant bacteria that have the medical community scared out of its wits. Their worries are not unfounded because these critters cannot be killed by any antibiotic currently known to mankind. And here is an oil that can destroy this notorious bacterial strain! Could it really be true? Well, you can’t dispute the claim because reports from third party agencies confirm it. I mean they have no reason to lie. Plus, the fact that the manufacturers of Nature’s 86 had their product analyzed in an independent laboratory says a lot not just about their integrity but also about the confidence they have in their formulation. I wanted to know how they achieved the impossible. I admit, I still had an inkling of doubt in my mind. After all, here was a product that could replace Neosporin. And, we all know that ointment has been the go-to formulation for all boo-boos. Mommies all over the US have trusted it for decades. Could Nature’s 86 truly be better? You won’t believe your eyes when you see the ingredients list! As I mulled over the answer to this question, I ended up looking at the ingredients list of Nature’s 86. And, there was the second surprise! It was simply a list of fatty acids with their benefits. The flicker of doubt was now turning into a steady flame. I couldn’t help but wonder if these humble triglycerides could actually do so much. So, I started researching in earnest and the results of some of the studies left me speechless. I have listed a few of them in the reference section and I am going to give you a quick rundown of what they say. Long chain mono and polyunsaturated fatty acids (FA) prevent both the growth and the survival of disease causing critters and they work in a multitude of ways to do so. These FAs target the cell membrane of microorganisms, causing it to go weak and rupture. In simple words, these bad boys literally gut the damn critters. But before the lipids drive the microorganisms to their sordid end, they make everything on the inside malfunction by influencing various cellular processes, including energy production. The FAs also make it hard for the germs to absorb nutrients, starving them in the process. With no food coming in and no energy being produced on the inside, the critters take a hit from both sides. Once these triglycerides drive a hole in the cellular membrane, they also increase the pace at which the germs lose the fluids held inside the cells. Above all, these lipids stop the critters from forming the slimy bacterial film, which turns into a harboring ground for the critters. The way I see it, those germs don’t stand a chance against these lipids. But, there is more! When they are not acting as straight out germ killers, these fatty acids make sure that the critters cannot propagate. The best part is that these lipids not only work against bacteria but are also just as potent against viruses and fungi, which is way more than what OTC antibiotic ointments can do. Simply put, these natural compounds offer broad-spectrum protection without harming the skin cells. These lipids also directly impact the inflammatory response. This means, they not only control the redness and the swelling but also reduce the pain. Because inflammation is kept in check, the healing starts faster and there is a lower risk of scar tissue formation. Talk about multiple modes of action! Of the unsaturated fatty acids, alpha-linolenic acid has the greatest potential against bacteria while docosahexaenoic acid is exceptionally effective in destroying resistant bacterial strains. Nature’s 86 has both of these fatty acids and several others. There it was. The scientific proof that I needed to put my doubts to rest. But, I am not the one to get convinced easily. So the question lingered in my mind, how is this product better than Neosporin? I mean doesn’t the ointment also kill the critters. The reign of Neosporin ends and Nature’s 86 is more than a worthy successor! Some more reading and I knew why the medical community has suddenly gone against Neosporin and other OTC antibiotic formulations. The problem with such products is that they disrupt the natural microbiome of your skin (the good critters that have made a home out of your body). When the good guys are killed, it simply creates more room for the bad guys to thrive. Plus, the bad guys get a taste of the weapons we have, in the form of antibiotics. So, sustained use of these drugs, even topically, gives these critters enough time to develop resistance to these and other antibiotics. Moreover, consistent use of antibacterial gels quickly leads to sensitivity. So, 8 days of continuous use of Neosporin to heal a bruise/cut, will actually turn it into a festering and oozing wound. Get a load of this – According to doctors, none of those OTC antibiotic ointments help to prevent infection or scarring or speed up healing. But, the fatty acids in Nature’s 86 can do all of that and more. I was convinced and ready to buy the product. After all, the proof is in the pudding they say and I sure wanted to try out this pudding, err oil. The oil was supplied in a glass bottle with a dropper, which I reckoned was quite thoughtful. The last thing I want to do is reach out for an antibacterial formulation with my fingers and transfer the critters from my skin into the preparation. Of course, I wasn’t going to wait to try out the product. Frankly, I was curious to know what it felt like. So, I tested the oil on the back of my hand. The feel: Simply put, it’s different! Although they call the blend essential oils for pain, it is both odourless and colourless because they haven’t actually used aromatic extracts in the formulation. Nature’s 86 is neither oily nor watery; I’d say it’s more like a light emulsion or a serum if you prefer. Permeability: The one thing that amazed me was the skin penetrability of the formulation. I applied a drop on unbroken skin and it seeped right in, without leaving the oily trace that you would normally associate with a product that contains lipids. A family lunch over the weekend that involved a lot of cutting and chopping gave me my second chance to use the formulation. How can you not end up with a bleeding finger when you are dealing with a combination of toddlers, onions, a mad rush and a sharp knife? The cut was not serious enough to warrant an ER visit, but it was a quite a gash. I washed the wound, stemmed the bleeding and put a single drop of Nature’s 86 on it, followed by a regular bandage and forgot all about it. The action: The rapid pace of healing was hard to miss. Let alone an improvement, with a cut that size, you don’t even see a decrease in inflammation in a matter of a few hours. But by evening, I only had minimal redness and almost no pain. Surprisingly, the cut seemed to be closing. So, I concur with the makers of Nature’s 86, these certainly are essential oils for cuts, just in a different sense. One product many uses: Since then, I have used Nature’s 86 on bug bites, bruises, rash, minor burns, general skin dryness, oozing blisters and more. Any boo-boo of any kind in the household or even in the neighbourhood and I would bring out my bottle of Nature’s 86. Hey, I don’t call it the acid test for nothing! Well, the oil worked each time and although I am stingy with my words of praise, even I can’t deny that Nature’s 86 came through with flying colors. It stands true on almost all the claims made by its manufacturers. It’s a natural product, so you don’t have to worry about encouraging the growth of antibiotic resistant bacterial strains. It works on all types of infectious microorganisms, including fungus, bacteria and viruses. It controls inflammation, redness and swelling. It leads to faster wound healing. It can be used in combination with other topical products. It’s gentle enough to be used on children and those with compromised skin barrier functions. It can be used over an extended period of time, without the risk of allergic reactions. It does not have the medicinal odor of antibiotic ointments. It isn’t oily, so it goes well with a regular adhesive bandage. The only manufacturer claim that Nature’s 86 does not live up to is that of immediate pain relief. I can safely say that it’s nowhere close to being a topical anaesthetic. But, then you don’t get that effect from regular antibiotic ointments either. Actually, doctors are of the opinion that letting your body deal with the initial sharp pain (in case of minor wounds and burns) is a better approach since it helps to taper down the discomfort over time. In contrast, when you numb the pain, it comes back with twice the force once the anaesthetic wears off. Hence, I won’t really call this a disadvantage. The price: At $12.99, Nature’s 86 cost a bit more than most OTC antibiotic ointments, which can be bought for $6 to $7. However, when you think about all the good that it does versus the harm that the antibiotics are capable of, the extra dollars seem like a worthy investment. A little goes a long way: Even when you are covering a large area with it, you will seldom need more than 2-3 drops of Nature’s 86. So, a 4 ml bottle lasts for a while. Nature friendly: This is a 100% organic and natural product made with ingredients derived from natural, renewable resources. Multi-purpose product: The oil can be used for medicinal and cosmetic purposes. Because it’s light weight, the proprietary blend can be used as a carrier oil. Money back guarantee: The purchase is protected by a 60-day money back return policy. Made in the US: Nature’s 86 is an American company that works out of Minnesota. They source their ingredients, raw material and oils from US based suppliers. Manufactured in compliance with FDA laws: Because you are dealing with a company based in the US, you can be sure that the Good Manufacturing Practice (GMP) guidelines that are part of Food & Drug Administration’s Title 21 Code of Federal Regulations have been followed. Informative website: The manufacturers of Nature’s 86 not only tell you why you need to buy this oil but also give you tips on how to use it. The good news is that the benefits don’t just end there! The makers of Nature’s 86 are offering a combo deal on this truly great product. Normally, you’d pay $12.99 for a bottle, but if you buy two, you get them for $19.99. That’s just $10/bottle, and I would say it’s a killer deal that you should not miss. To Buy Nature’s 86 Pain Relief and Healing Oil, go here. Hip Pain? Try These Highly Effective Essential Oil Recipes For Natural, Safe and Long-Lasting Relief! My parents bought one recently for the grandkids and it is very safe and effective. Just a single drop on wounds, cuts heals the area in a day. Thanks for the review, it is much appreciated.